It seemed like it was trying to be fall earlier this week. Florida standards trying to be fall is something under 85 degrees with under 70% humidity. We had some lower 80's this week with lower humidity and it was nice. Now it's back to upper 80's with higher humidity and it's gross again. I'll have to hold out for fall until November. I don't even need what people really consider fall. I'll take temps in the 70's and lower humidity! Anyways, despite it not being fall-like outdoors I make it that way indoors. I have my Halloween and fall decor up. I'm melting fall scents in my wax warmer. I'm wearing fall nail polish colors. This Northern Star polish is one I recently added to my stash! 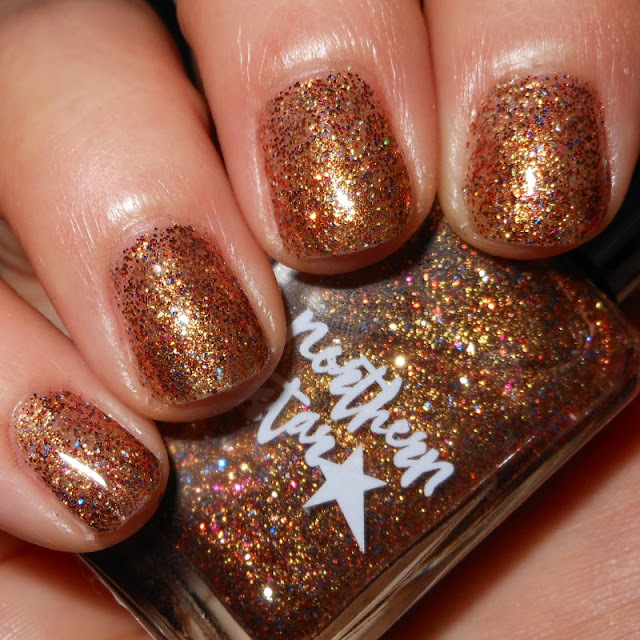 Pumpkins and Stuff is golden shimmer base with burnt orange, blue, brown, pink, and gold micro glitters. Color: This is the perfect fall combination of glitters. I love the overall golden warm hue of this glitter with the addition of the blue and pink glitters. Those contrasting colors really liven up this glitter and give it some depth and added beauty! Formula: This is advertised as a glitter topper. 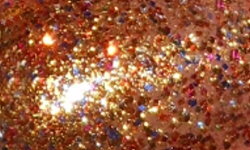 It can be used as such, and you would really only need one coat as this glitter is dense. I preferred it as a full coverage glitter. I used 3 coats here above. You will not get 100% coverage, but I feel like the coverage is enough where from any normal distance you view your nails it will look completely covered. The formula was easy to use and glitter was very easy to apply. Price: This is $9.00 on Northern Star's etsy site. Overall: I love this glitter! This is the perfect fall glitter and I like that it can be worn full coverage. The color of this glitter is beautiful. It has the perfect base of fall tones with hints of contrasting colors that make this beautiful and special. Great glitter for fall all around!